The CW has announced that the best looking Baldwin of the bunch will be guest starring on 'Gossip Girl' as Serena's mysterious long-lost Daddy. In theory.... GREAT! 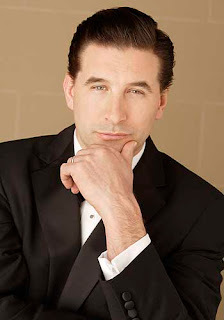 Billy Baldwin will provide some much needed man candy -- provided he hasn't gone the way of his big bro' Alec. But not so fast.....before we get too excited about the latest addition to our favourite UES peeps, the casting of Billy is a bit off colour --- if you recall from the not-so special flashback ep last season, Serena's Dad is blonde. VERY BLONDE. Not a whisper of Sun In or anything of the like to suggest that he was just faking it as a teen. In the scramble to cast a big poppa for Blake Lively's Serena, looks like the casting department is suffering from short term memory loss. Continuity sure isn't what it used to be! Meh. My mother's hair was naturally platinum blonde as a child. It darkened over the years and is now the same shade as Mr. Baldwin's. True, however Serena's pops was shown with platinum locks as a teen - usually white-blonde kiddies are not that fair as teens; their hair darkens during puberty.